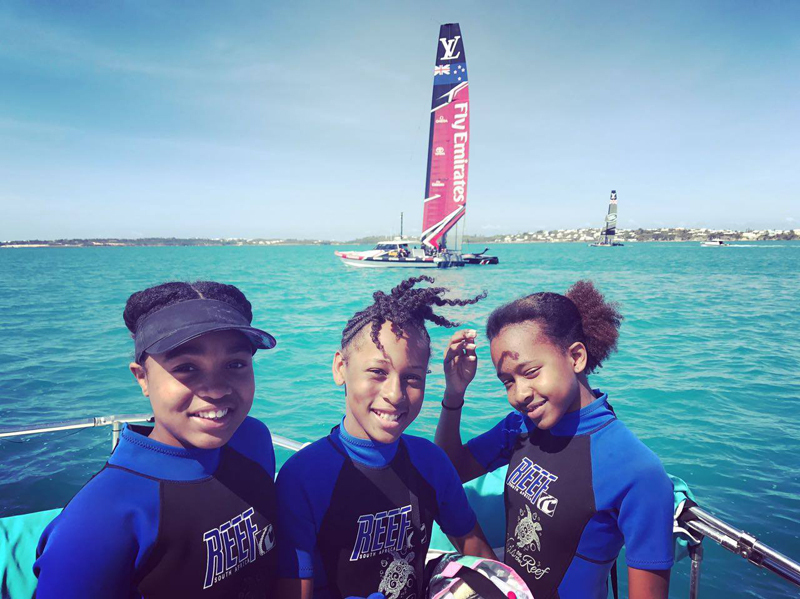 The XL Catlin Kids on the Reef programme, a partnership between the Bermuda Zoological Society [BZS] and the I Am Water Foundation, sponsored by XL Catlin has now completed its fifth successful year. The programme brings together world-class free-diving conservationists and local marine ecology educators to take local public middle school students beyond the classroom and the beach, into and under the ocean surface. Based on a firm belief that we protect what we love, this innovative two-day workshop strives to open up a world of wonder while teaching important marine and conservation modules. In October of 2012, TEDxBermuda held a seminar at the Fairmont Southampton, where Hanli Prinsloo, the founder of the I Am Water Foundation, gave a talk on ocean conservation through human experience, which is the Foundation’s main focus. One of those persons attending the talk was the then CEO of Catlin Bermuda, Graham Pewter. He was so inspired by Ms. Prinsloo’s talk that he arranged to have the Catlin Bermuda Charities Committee work with Ms. Prinsloo, her employer the I Am Water Foundation and the BZS to create the Kids on the Reef programme. XL Catlin has continued to be the keen and committed sponsor of the programme, which has provided a total of approximately 720 local public middle school students with the opportunity to explore marine conservation. Middle school students are the target audience for the course as this is a significant time for that age group to begin contemplating their future. Giving students the opportunity to learn and explore their local environment in such an immersive way opens their minds to the possibility of a career in marine conservation and coral reef ecology. 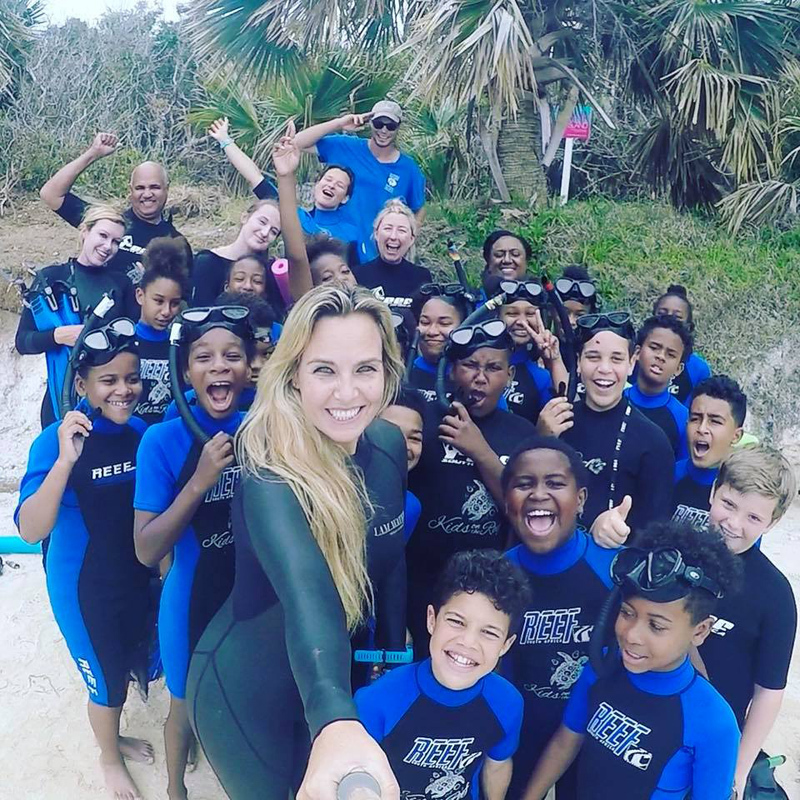 This year Beth Neale, the I Am Water Foundation’s “living mermaid”, returned to Bermuda to assist Dr. Alex Amat, BZS educator and the programme co-ordinator with the two-day workshops. The workshops include both confined water and open water free diving instruction, as well as classroom teaching. Before entering the water, the students learn about coral reef ecology, ocean conservation and personal development, and through yoga, they learn breath and body control, so they can develop an awareness that transfers to the water as they begin exploring — first through snorkeling and then free diving. This year the first day of orientation for the students from T. N. Tatem, Whitney Institute and Dellwood, was held on Trunk Island, the BZS’s newly established “living classroom”. On their second day, the students were taken out to a reef to explore and depending on the weather for the day; the locations varied between John Smith’s Bay, the Northern Lagoon, the Western Cut or the Great Sound. On one of the days that the students were taken to the Great Sound, they were fortunate enough to see the America’s Cup teams practicing in the distance in preparation for AC 35. 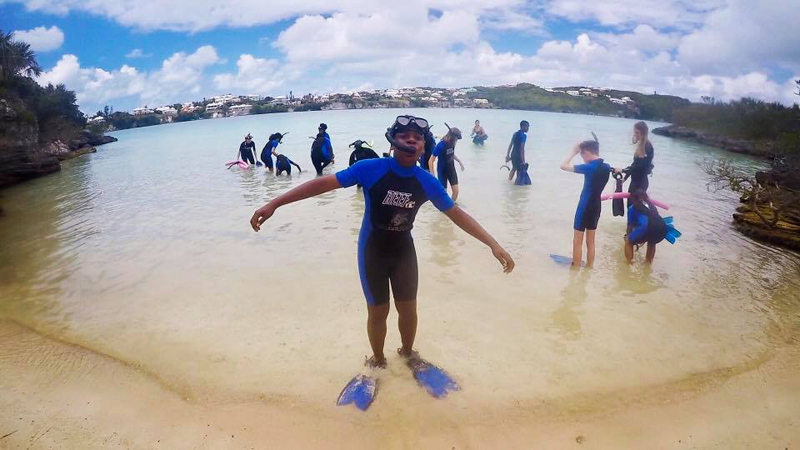 “It was a privilege for me to once again have the opportunity to team up with Dr. Alex Amat and the BZS team to positively transform the lives of middle school Bermudians through the immersive two-day ocean conservation, education and experience programme,” said Beth Neale. In previous years the Kids on the Reef team has not only offered the two-day courses for schoolchildren, but has also offered ocean free diving courses for adults. Some participants have a personal interest in free diving and train with our visiting instructors where they are given the opportunity to obtain a Level 1 Free Diving certification. In return they are normally asked to be involved in four sessions with the kids, but most of them have been giving back way beyond this. “The XL Catlin Kids on the Reef programme would not be as successful without the assistance of our amazing committed volunteers,” said Dr. Alex Amat. “Some have been helping for several years now and it is great to see the numbers of those helpers growing year after year. As the volunteers get more comfortable in the water and with free diving, they are able to give more to the children and it has been truly awesome to see these mentoring relationships flourish. Thank you Catlin for all you do for Bermuda!! !